Best Days: Most days: small mix of swells from the south (Tues/Wed), and east (mainly Wed/Thurs onwards), with an extended period of light variable winds. Recap: SE Qld and Far Northern NSW have seen small peaky E’ly swells for the last few days with variable winds, size around the 2ft mark. Remaining Northern NSW coasts (to the south) saw the same E’ly swell but also picked up a building SE swell on Saturday afternoon that reached 3ft+ into Sunday before easing slowly today. The core part of the trough responsible for the weekend’s SE swell (for the Mid North Coast) is now well to our south and outside of our swell window. A developing NE infeed into the broad trough will generate small levels of E’ly swell all week (from Wednesday onwards), though mainly for the Mid North Coast as the fetch is best aimed towards Southern NSW. However, we’ll also see some long range (though ultimately moderate-period) E’ly swell from a lengthy fetch way out NE of New Zealand. 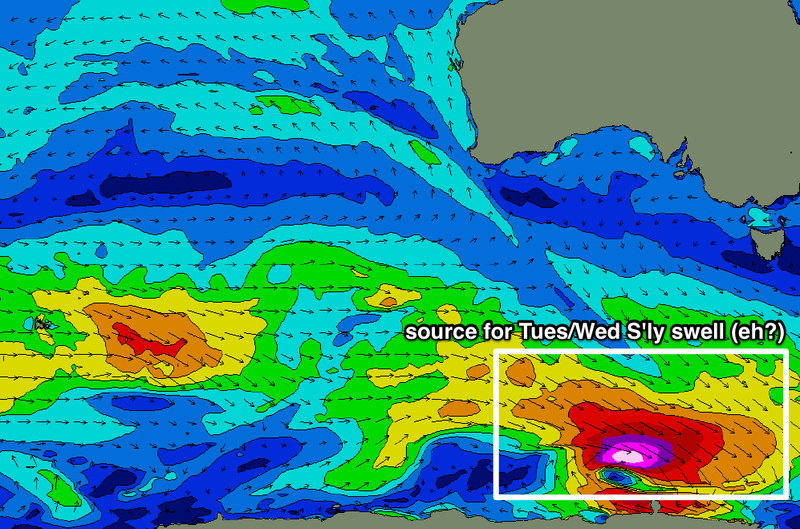 This will provide small surfable waves through the longer term period (from Thursday onwards). Don’t expect much more than a slow, inconsistent 2ft+ wave at exposed beaches. Prior to these E’ly swells building across the coast, expect a temporary minor dip in current (small) E’ly swells across all coasts on Tuesday and early Wednesday. As for other swell sources, the models are showing a small long period S’ly swell across Northern NSW on Tuesday and Wednesday, around half a metre at about 14-15 seconds. This didn’t really stand out when Friday’s notes were being (rapidly) prepared, however I’ve quickly hindcast the model data and can see it’s sourced from a poorly aligned W/SW thru' NW fetch around an intense polar low well south of Adelaide on Friday morning (see chart below). As you can see, the fetch is aimed well and truly away from our coast, though when projected over the great circle parts for the East Coast of Australia, it is marginally better aligned - but only just. What makes this system different is the way the storm track evolved, and where the intensification has occurred; right on the periphery of our acute southerly swell window - any further west or east would have ruled it out as a potential source of surf. It’s hard to imagine how we could possibly pick up a small S’ly swell from a NW fetch, but based on previous experience where these kinds of swells have slipped through the net, it’s quite plausible that we’ll see minor sideband S'ly energy glance the NSW coast on Tuesday afternoon and Wednesday: this is one of the rare moments when I think the model has actually resolved a flukey swell source well (I think the 60-70kt core wind speeds probably have something to do with it too - the models can’t ignore it!). 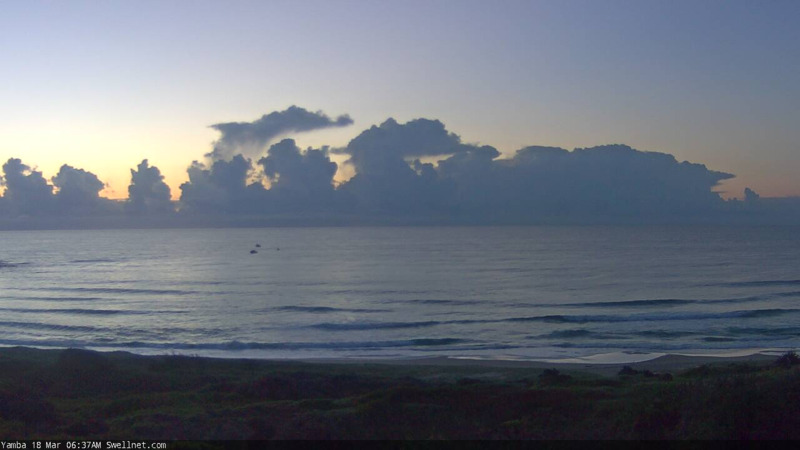 As such, most beaches will probably dip out from this source, but south swell magnets south of Byron should see occasional 2ft, maybe 2-3ft waves over the coming days (expect a delay on Tuesday, especially in the Far North). Keep your expectations low and you may be pleasantly surprised. 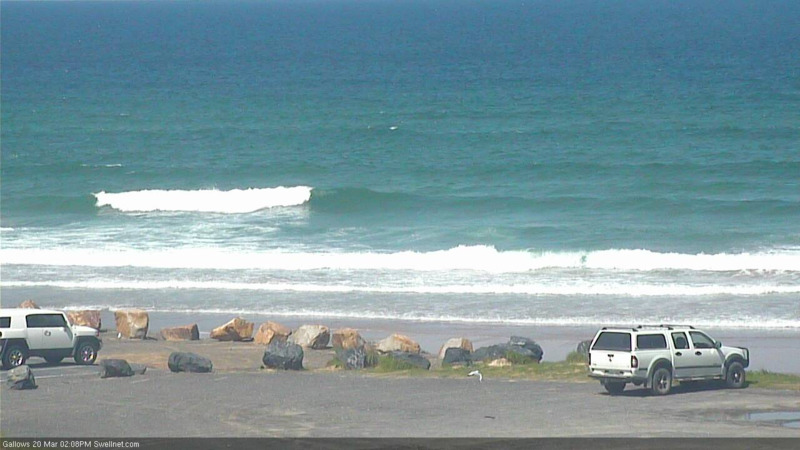 This S'ly swell will fade later Wednesday and into Thursday as the E’ly swells start to be a little more dominant. No major change expected this weekend, from what we’re expecting on Thursday and Friday, which is, small, intermittent E’ly swells offering occasional 2-3ft sets across exposed beaches. To be a little more specific, I'm expecting a touch more size this weekend than later this week, as we'll see the swell periods kick up a fraction thanks to stronger core winds from our distant E'ly swell source. But, there will be considerable breaks of tiny conditions between the bigger waves, with a distinct lack of mid-range energy to fill in the gaps. Winds should remain light and variable on Saturday under the persistent troughy pattern but Sunday is at risk of developing northerly winds as a series of fronts approach the SE corner of the country. "generating large E’ly swell sometime around the first few days of April." Old mate on a SUP giving us a size reference at Coffs. Day after day of babyfood. Didn't think it was possible for this autumn to start worse than last autumn, but here we are. No sign of any seasonal shift in sight. Last week has just been a classic week....for October. Pissant little S and SE swell's, NE sea breezes and afternoon storms. My citrus trees are flowering, normally a spring event. Seasonal reversals are the new normal. The strongest Tradewinds we've had in the last 18months were in Sep/Oct last year. Tasman sea heatwave remains firmly locked in place, which means all those juicy long range charts are likely to do what they've done all season: downgrade as we get closer to the actuality. Maybe winter time we might see that warm water pooled in the lower Tasman explode with ECL's. Otherwise, I'm ready to join old mate and get the SUP out from under the house. How come all that warm water hasn't caused more cyclones? 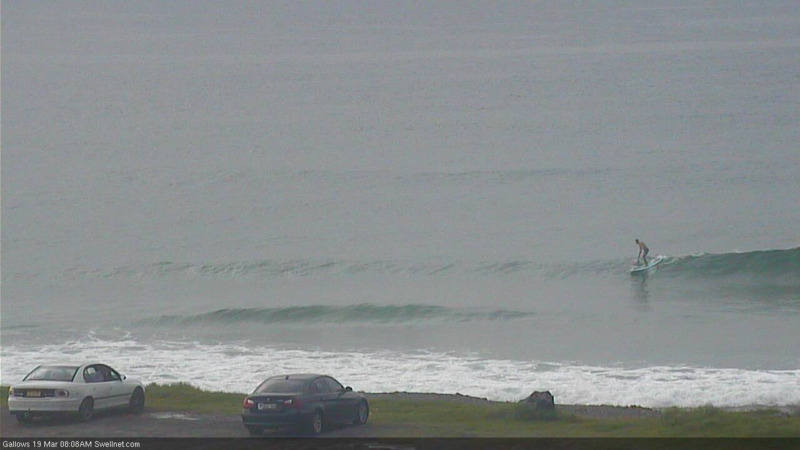 I found a 2ft peak sat/sun back beaches nth NSW- heading back tomorrow morning and hopefully the bank isn't to full. Was actually half fun under the light westerlies- however by 10am even the 5 knot onshore had ruined it. Desperate times, but at least it was a clean wave? it's in the lower Tasman sea and around New Zealand. Models didn’t pick that south swell on the MNC today. Funny about the citrus trees! Thought my lime tree was dead but after a few recent showers it has woken up and has just started flowering as well . Ground is still very dry though. Models did pick it up, and it was discussed in my notes too. Model says 1ft surf with 0.7m east swell? Looks like a south swell. Ignore the surf height caculation (it's too small, because the wave model has undercalled the size of the swell). 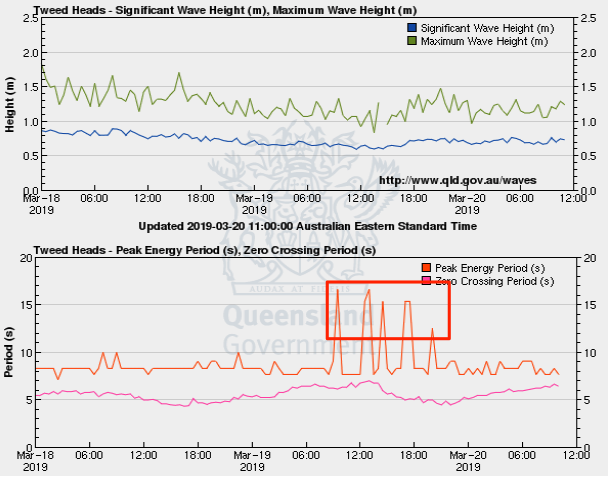 There's a secondary south swell in the water - see below (from our Coffs data point), around half a metre at 14 seconds. Tweed buoy picked up a faint S'ly swell signal yesterday, though it's gone today. Ironically, this morning looked a smidge bigger than yesterday. Small lines of south swell at Coffs.